Benjamin conjured history as an angel. Let’s sit with that for a bit, as it’s a lovely sad conjuring. There is no repair, not for the angel, not for us. Sad, perhaps, but not unbearably so. There is also no going back, as that angel learned. If the past is an ocean, then history is diving in and bringing the bits and debris and life to the surface, to the present, to see what we’ve got. We can bring what’s down below to the surface and we can make sense of it, but it is our sense, a present sense. And the things themselves, especially the lives themselves, are changed for having been dragged from the deep. Diving, digging, spelunking: all this bringing to the surface the bits and debris in attempt to recreate life. History as simulacrum. And the epochs and eras and moments? Those are the bits highlighted or strung together: the Renaissance or Scientific Revolution or Modernity or the Enlightenment. It gives us a way to see. Usually, when I speak of seeing, I speak metaphorically. 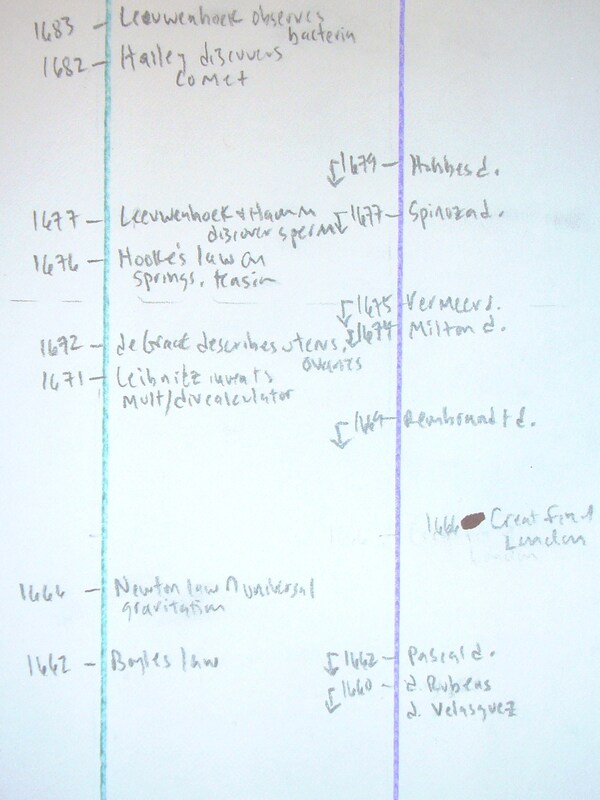 But I wanted literally to see where these different moments were in relation to one another, so I ran parallel timelines of European history—scientific, cultural, religious, political, trade—down sheets of paper taped in my hallway, then plotted out those moments. This is an incomplete draft—I clearly need to allow more room on the final version—but it’s not hard to see how this moment was understand as Italian Renaissance at its ripest. These give me that bird’s eye view of the middle centuries of the last millennium; they also make me wonder what isn’t there, isn’t recorded in any of the texts I’m using. What moments are still underground? And what stories will we tell if we ever unearth them? Modern thought(less): In which I discuss the margins of modernity, multiplicity, and epistemological nihilism. . . I have not abandoned medieval thought. Okay, yes, I have been skipping from the 16th century to the 4th century to the 21st century and now, the 19th (Weber) and 20th (Berlin) centuries. There’s a purpose in all this hopscotching, there is. Somewhere. I mentioned oh-so-long ago that I was going back in an attempt to make sense of now, back to the end of the last great (European) ontological moment for clues on what might be the end of the current, modern moment. I noted that I had become increasingly dubious of the notion of the post-modern, and thought that perhaps we might be simply be at the fraying ends of modernity. Now I’m not even so sure about the “fraying ends”; that we may be at the far side of modernity does not yet mean we have reached the limits of this territory. There may be margins we can approach, but “ends” or “afters”? No, I don’t think so. There are multiple modernities, just as there were multiple medievalisms; such multiplicity within (as opposed to, alongside) modernity creates problems which did not exist for medieval thinkers: unlike medieval thinkers, who worked toward unity, modern thinkers have tended to presuppose a unity in both method and outlook. Such unity has been long questioned—most obviously by Hume and Nietzsche—but it seemed that only in the latter half of the 20th century that skepticism about modernity’s (modernities’?) presuppositions came to the fore, a skepticism which is often called “post-modernism”. But this skepticism, even undermining of the presuppositions seems itself to emerge from modernity and to be obsessed with questions of modernity, and it is not at all clear to me that laying bare the complexities and contradictions of the various modernities is in any way post-modern. Well, in any way save one: the shattering of epistemological unity (again, which cracks long predate the 20th c) irreversibly breaches one of the boundaries of modernity, and it is here, and only here, that any thinkers, in grappling with such nihilism, may be said to advancing beyond modernity. That matters. A lot. But even the shattering of such epistemological unity does not itself obliterate the methods which rested unconcerned above it. In other words, measurement, observation, reduction, generalization, and, of course, reason, are still powerful tools for dismantling and reassembling the world, even if they are no longer all-powerful. The foundation crumbles, but the world still stands, and it’s not at all clear to me that scattering of foundational certainties necessarily leads to the dissolution of modernity; it may, in fact, simply have revealed the plurality of modernities which were, as the saying goes, always already there. Perhaps I should not have used the term “negation”. It carries a philosophical load—which is fine, and not unrelated to my use of it—but I wanted (also) to emphasize the more prosaic, i.e., practical, aspects of negation, as in: to negate, to eliminate as an option or consideration. The germ theory of disease negated theories of miasma, Lavoisier’s experiments with oxygen negated phlogiston, industrial production of beakers and test tubes negated the need for scientists to blow their own glassware (which further negated the need for the knowledge of blowing glassware), fuel injection will likely negate carburetors, etc. So negation could mean “overturn” (as with germs > miasmas or oxygen > phlogiston) or “leave behind” (as with glass-blowing and carburetors), that is, to negate may be to disprove or it could mean to render irrelevant or trivial. Now, these practical effects may reverberate ontologically, such that the negation of the practical may serve to negate an entire way of thinking or being, or simply to serve as a signal of the instability of that way of thinking/being. Thomas Kuhn’s The Structure of Scientific Revolutions, with its discussion of paradigm shifts rendering previous modes of scientific practice inert, lays out a version of global negation, while current questions of the role of cyber-technologies signal uncertainty over what counts as “real”. Natural philosophy took for itself the name science, and modernity marched on. The laments for the old world died with those who once lived in it. History is not a line, or rather, history only holds the line, such that events may loosen or smash that hold and the contents of that history scatter. Some of those pieces are lost and even of those which are found, the meaning of the piece, precisely because it has been scattered, can only be guessed at. It is shard of pottery uncovered in the desert, hinting at something which once was, now gone. But not everything is lost: it could be hiding in that proverbial plain sight. I’m much taken with the notion of the palimpsest—that is, of a kind of tablet which has been inscribed then scrubbed clean to be reinscribed—largely because I think that the previous inscriptions are still there, that, like words which have been erased from a page, the impression lingers. Those who complain that Manhattan has turned into a theme park and that Times Square has lost all its gritty reality have not a little bit in common with Herr Heidegger. I have a great deal of sympathy for this feeling, but even more skepticism for such sympathy; as I’ve mentioned more times than you probably care to read, we’re never who we’ve been. So, again, I’m not taking the side of the past against the present, not least because I have no basis for such a taking of sides. 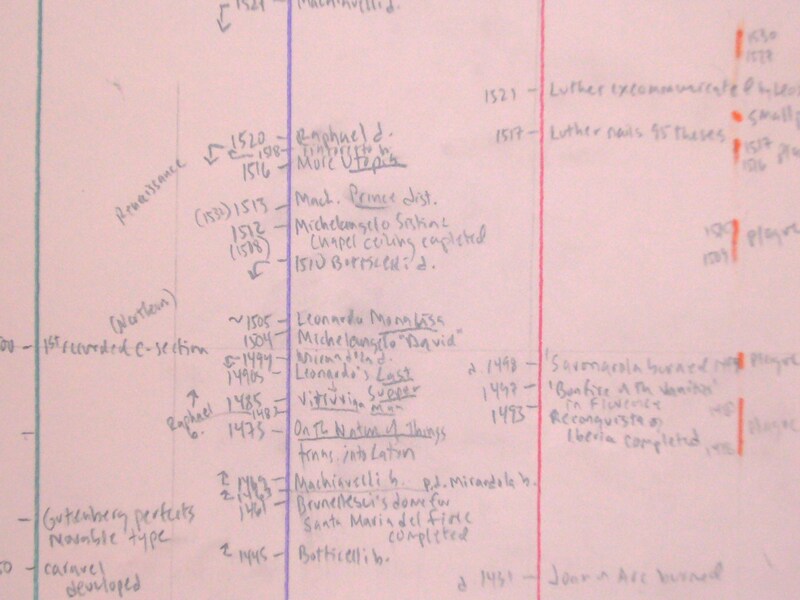 Again, I simply want to trace the history of modern history. I can’t raise all the inscriptions on the palimpsest, but maybe I can see some of what has been left behind.